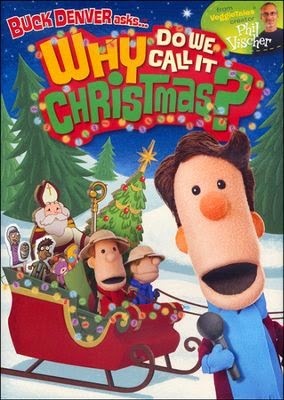 When FlyBy Promotions offered an opportunity to review Buck Denver asks... Why Do We Call It Christmas? I did not have to contemplate it at all. No thinking or deciding required. I sent an enthusiastic YES! We love Buck Denver here. My kids have learned so much by watching through the 13-volume What's In the Bible set. That's all of them, from the 8-year-old to the 17-year-old. And Mom and Dad too. That series is simply fabulous, so of course we were interested in a Christmas DVD. Well, all our favorite Buck Denver and Friends characters are in here. The basic "plot" is that Buck Denver is a bit confused about what Christmas is really all about, so he invites everyone to join him, and they all have various adventures in getting there. Along the way, they talk about all kinds of stuff, like the list up above. Luke 2 is shown via popsicle stick puppets, with awesome background music. It includes a bunch of discussion about things like what angels look like (not little babies with wings) and why they always start off conversations with people by saying, "Don't freak out! I'm not going to hurt you!" "Getting a great deal on a new TV! That's what Christmas is all about!" brings us into a great discussion about why Christmas is important, with a pretty clear gospel presentation in here too, in the discussion of who Emmanuel is. Basically - We can't be perfect, and unless we are perfect, we can't go to God. So God came to us. "The miracle of Christmas is for everyone!" Do you want to win one? Open to US and Canada only, must be 18 to enter. We have DVDs 1-8 and 10-13. Not quite sure how we missed 9. :) I'd love to see the Christmas video and the Wonderblimp shows. Definitely another hit from Phil Vischer. We haven't seen any of these yet, but love Veggie Tales. I suspect we'll love this series, too. We love the "What's in the Bible" series too, although we only own the first 4 DVD's. I'd love to see the Christmas DVD! I really like the first one that explains the divisions of the Bible. I've never seen any of these videos before. I think it's great for my kid's to hear the true meaning of Christmas from as many different sources as possible. I have never seen any of these DVDs, though I am really intrigued. As for this DVD specifically, I love that Hanukkah is also included. Thanks for reviewing this dvd. We've been talking about getting it for our kids, but I hadn't heard too much about it.